Just arrived. I’ll let them rest a couple weeks, but from my last box I’ve never had so much taste and a small cigar. They look great and smell even better. So, even though I usually dislike small gauge cigars this is a must! I was very excited to get these cigars.. Beautiful box and lots of good reviews everywhere. I usually smoke every cigar right off the truck, this one had little tough draw and went out few times. 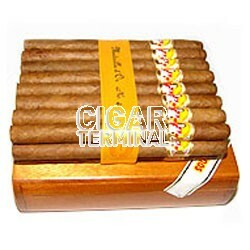 I will need to rest these in my humidor and see if it gets better. Great cigar, nice creamy, vanilla finish that you wanna burn down to your fingers. Great even burn, perfect for a quick smoke. Will definitely get again! One has to love the presentation of this cigar - long sleek shape, nice varnished box. I'm not normally a big fan of skinny cigars, but this stick was very enjoyable (albeit a short smoke). Pre-light aroma was distinctively Cuban - rich tobacco and slight pepper. The burn was consistent and provided a lot of good tasty smoke. This cigar is great for a quick smoke. Never had so much flavor from a small gauged cigar. Smooth, huge amounts of vanilla and wood. These must not get rushed out of the door like some more well-known brands.